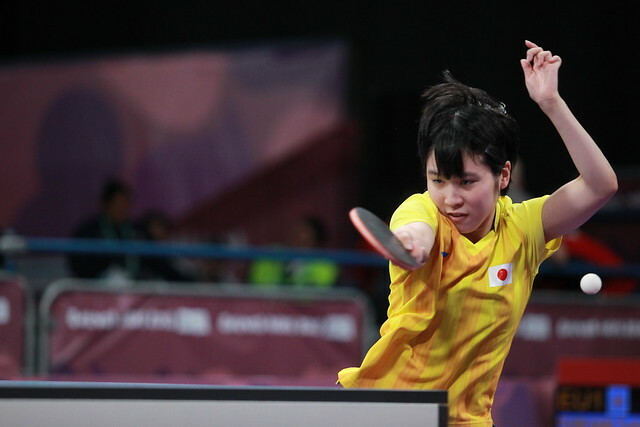 Talented teenage left handers on duty, Chinese Taipei’s Lin Yun-Ju, China’s Wang Chuqin and Singapore’s Pang Yew En Koen all emerged successful in their opening round Men’s Singles contests at the Buenos Aires 2018 Youth Olympic Games on Tuesday 9th October. All recorded wins as their status advised but of the group, it was Pang Yew En Koen who attracted the attention. Both Lin Yun-Ju, the no.4 seed and Wang Chuqin, the no.6 seed had remained unbeaten during their group phase matches; in the opening round, both continued their winning ways. Lin Yun-Ju beat Chile’s Nicolas Burgos, the no.14 seed (11-7, 11-7, 11-4, 11-5); in a rather more testing encounter, Wang Chuqin recovered from a two games to nil deficit to overcome fellow left hander, Russia’s Vladimir Sidorenko (5-11, 10-12, 11-5, 13-11, 11-8, 11-2). Rather differently, Pang Yew En Koen, the no.10 seed, had finished in second position in his group, losing to Ioannis Sgouropoulos of Greece, the no.8 seed (11-3, 11-9, 11-6, 11-6, 12-10, 11-9). In the opening round Pang Yew En Koen faced the man in form; he confronted Iran’s hitherto unbeaten Amin Ahmadian, the no.12 seed, the young man who had topped his group notably beating India’s Manav Vikash Thakkar, the no.5 seed (11-9, 10-12, 11-6, 11-7, 11-8). In the group stage there was no stopping Amin Ahmadian; in the opening round he was stopped in abrupt fashion; Pang Yew En Koen recorded a straight games win (12-10, 12-10, 11-9, 11-2). Success for Lin Yun-Ju, Pang Yew En Koen and Wang Chuqin as ranking advised; it was the same in the remaining first round Men’s Singles engagements. Notably, Japan’s Tomokazu Harimoto, the top seed, beat Manav Vikash Thakkar (9-11, 11-8, 11-7, 11-8, 11-7). Also, in the top half of the draw, Romania’s Cristian Pletea, the no.9 seed, accounted for Italy’s Leonardo Mutti, the no.15 seed (11-9, 6-11, 11-4, 11-9, 11-3); Ioannis Sgouroplous, the no.8 seed, halted French progress; he ended the aspirations of Bastien Rembert, the no.11 seed (11-9, 8-11, 11-4, 8-11, 11-9, 11-8). Meanwhile, in the lower half of the draw, Sweden’s Truls Moregard, the no.3 seed, prevailed against Egypt’s Youssef Abdel-Aziz, the no.7 seed (11-6, 9-11, 9-11, 12-10, 11-9, 11-7); Kanak Jha of the United States, the no.2 seed, overcame Brazil’s Guillerme Teodoro (12-10, 11-5, 7-11, 11-3, 11-9). At the quarter-final stage Tomokazu Harimoto meets Cristian Pletea, Ioannis Sgouropoulos plays Lin Yun-Ju; in the opposite half of the draw it is Truls Moregard versus Wang Chuqin, Pang Yew En Koen in opposition to Kanak Jha.